today we slowly increase the speed of incoming blogposts in your jungle again. 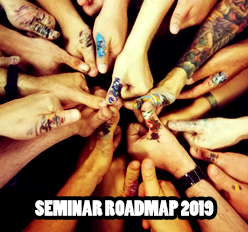 A lot of stuff is in preparation and frankly after last years MV's year of the painter 2 we never thought we will be able to bring you tutorials again. It was truely exhausting, but we hope for our readers a great experience. 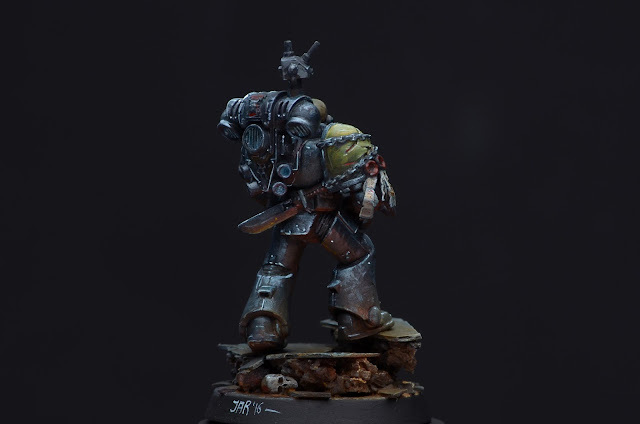 This year there will be no year of the painter, so no weekly garantueed tutorial, but of course we can not be silent in giving you insight in our work process. 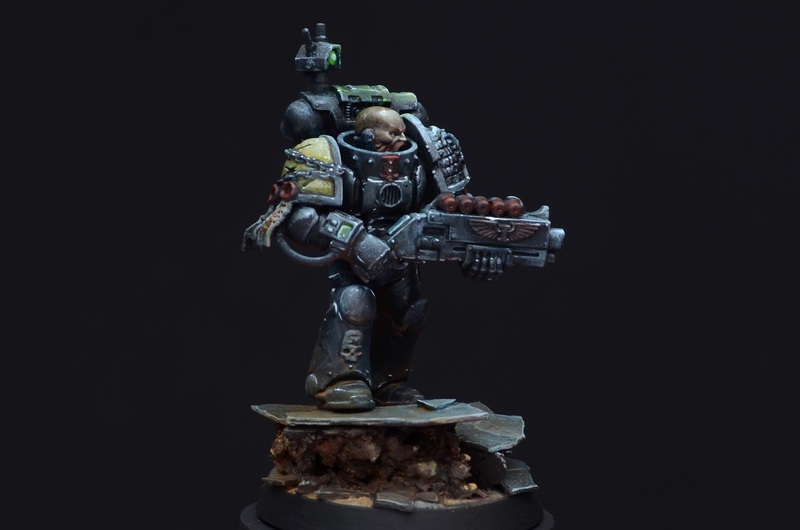 Today it is Roman with a short article about his thoughts on painting a Deathwatch Space Marine from Games Workshop in 28 mm. We hope you enjoy! This is a fast tutorial. An insight into my thoughts while I painted this one up. 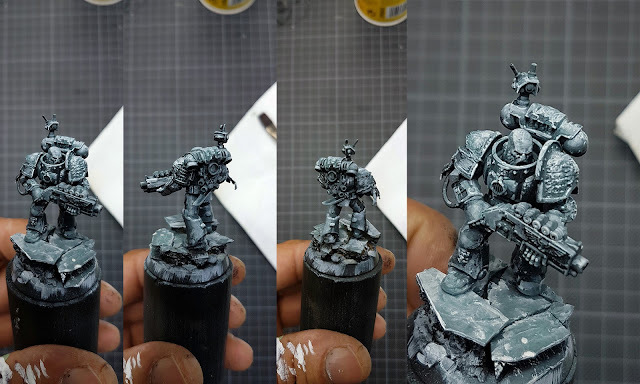 No step by step with color recipes, more a recipe on the approach to paint this fella up. He was primed black with GW black primer. After the the primer, I took white paint and a big drybrush. I thinned the paint with water a little bit to not apply too thick paint. Thinned paint dries different. We all know that. For example in this case white. On a black surface, if thinned with water it dries grey in the first application. If I do it again on top of it, it dries more with the looks of white. I did drybrush this guy in three layers with thinned white paint. Really rough, but focusing on the areas that are hit by my light source from above, at the same time pushing brightness in the upper body area. You can check back with my thumb to see the white and the grade of dillution I used here. To the left you can see the white dilluted. To the white I am getting stronger with more layers on top. Why I did that so rough? Well, recently I love to play and paint with textures. This rough color slapping keeps me away from thinking I have to do everything perfect in the first stages. I like this freedom and I enjoy the textures that are already appearing, even in the black and white. I will work with these. This technique can also be used as an underpainting to get an overview of your different values or - additional in this case - recieve some random textures to work with in future steps. In fact it is the same thought behind priming your miniature black and white. Many figure painters use this technique to understand the values and different hues of their project first. Very often I have seen it in a not so rough and wild way. 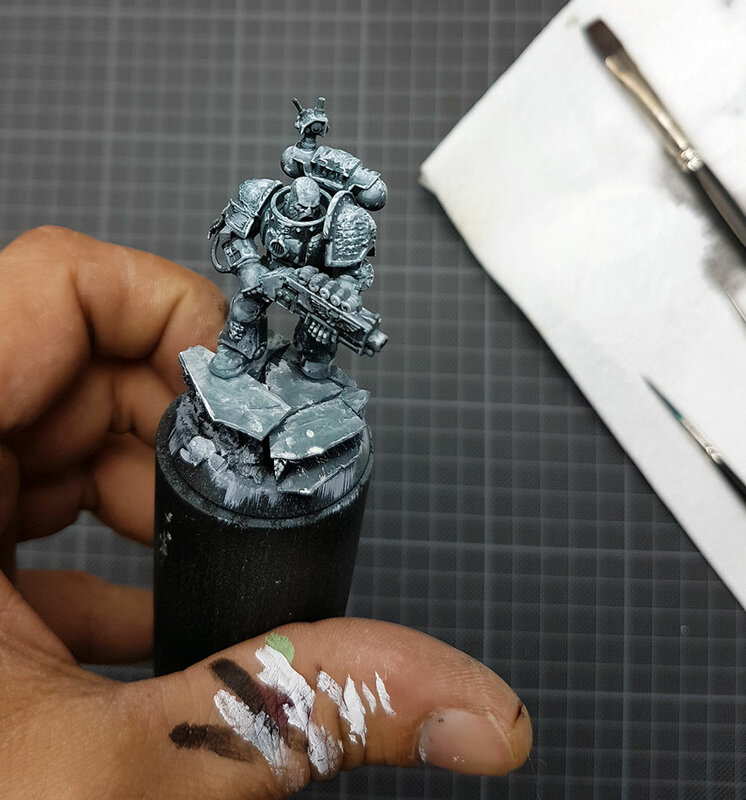 I came across this technique in my studies to become a teacher for art and art history, but when I started to paint miniatures I never cared. I got sucked in the "rules" of how to paint a clean miniature and never gave this a try until Alfonso Giraldes class in Augsburg in 2015. He opened up my eyes again on the way of painting that I knew, but lost. Once in a while I use it and enjoy it in my way. Rough and wild. Next stage was placing colors on this sketch. The colors I want in this particular place. Fast, a little more controlled, bam, bam. I used Schmincke Primacryl Primaries and black and white to mix what I need myself. At least for all normal colors while the metallics were done with Scale75 Silverset colors. In this sketch I also decided for a warm and cold colored side of the model. For this I roughly sketched it in with cold metal colors and warm orange reflections on his lower area. I also used the airbrush to spray a glaze (Very thinned paint. More water than color) over the warm and cold angle on the model. but still this fast approach gives me a good idea on where I am aiming. Of course I was not aiming to paint a high end clean Games Day entry here. This was never my goal. 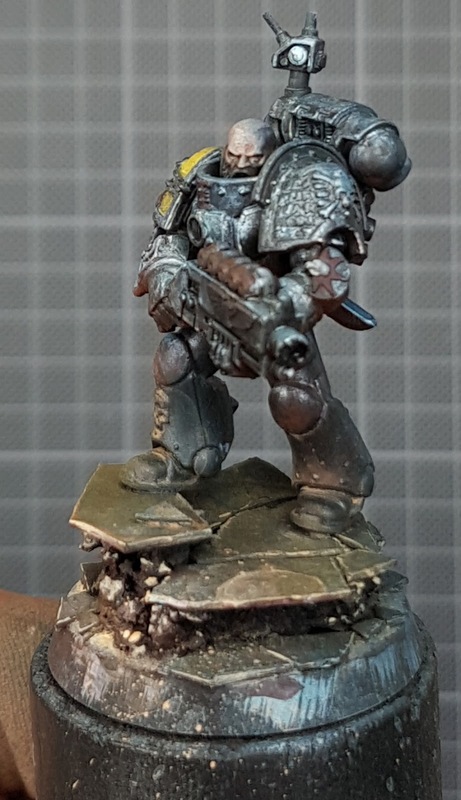 I just enjoyed painting a Space Marine, as I always will love Space Marines and it is healthy for my work if once in a while I'll do one. Still I wanted to do a little more than the sketchy part. So next stage was mainly about definition. While my sketch was undefined I went in the different materials again, placed darklinings, highlights in the specific colors, shine on the metal and details here and there. This stage can take a large amount of time. It is just about you on how much time you want to spent on this. You can always push further, repair something, clean up something, wax on, wax off and so on. The enjoyable thing for me in such a paintwork is that I always feel the roughness I placed before. I am not distracted in the beginning to try to paint an area smooth as I just can't do this with this foundation. On the way up I decide which area I will paint smoother than others, for example the face area or the yellow shoulder pad. This leaves me in control of quality contrast. Rough/Smooth. And I like my Space Marines to look rough. this will influance the look of your end result. 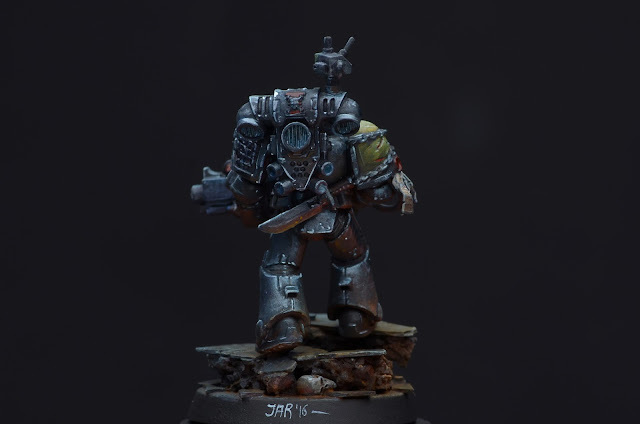 I painted this Marine just for fun in the middle of 2016 - as I told you a Space Marine once in a while is a healthy thing - with no aim to paint the best space marine I ever painted. Just for the fun of it and tons of happy painting. I hope you enjoyed this little journey through my brain. Lovely. I have started using something similar with under painting and high flow transparents from Liquitex to get a rough idea of where i want to go. Looks like all kinds of sloppy to start which can be terrifying if you aren't used to it but having faith and pushing through you get a clearer idea. Besides, there's nothing you can't start over! Thank you for the tutorial! I always like reading your thoughts on painting techniques. This is outstanding; one of the top three of yours i've ever seen.